Adam Grant is Wharton’s top-rated teacher. He has been recognized as one of HR’s most influential international thinkers, BusinessWeek’s favorite professor, one of the world’s forty best business professors under forty. Grant was tenured at Wharton while still in his twenties and has been honored with the Excellence in Teaching Award for every class he has taught. His first book, Give and Take, was a New York Times bestseller translated into twenty-seven languages and named one of the best books of 2013 by Amazon, Apple, the Financial Times, and the Wall Street Journal—as well as one of Oprah’s riveting reads, Fortune’s must-read business books, Harvard Business Review’s ideas that shaped management, and the Washington Post’s books every leader should read. His speaking and consulting clients include Google, the NFL, Merck, Goldman Sachs, Disney Pixar, the United Nations, and the U.S. Army and Navy. He serves as a contributing op-ed writer for the New York Times and was profiled in a cover story by its magazine. 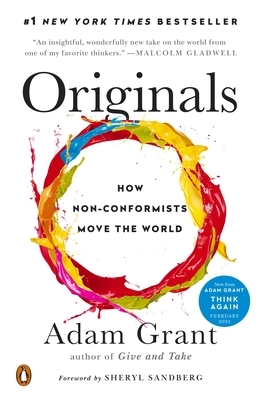 Coauthor of the new book Option B with Facebook COO and Lean In author Sheryl Sandberg, Grant earned his Ph.D. in organizational psychology from the University of Michigan and his B.A. from Harvard College.